First, ensure that an object has been added to your scene as is now selected. You can either select an object by clicking it within the main central view of by clicking its name within the 'Objects List' side window. There are a number of ways to move an object within the 3D space, each of which determine where the center anchor point of the object is positioned. Press each of the arrow keys on the keyboard, ← → ↑ ↓ to move the object in the corresponding x-y direction by 5%. If you use the arrow keys while holding down the Shift key, the object will be moved a shorter distance of 1%. Move your mouse over the object's move icon , and then hold down the mouse's left button and drag the object to a different x-y position. As you move the mouse, the status bar at the bottom of the studio's windows will inform you of its new position values. Simply let go of the mouse button to drop the object in its new position. By default, this method snaps the object to the nearest 1% value. To prevent this 'snap-to-grid', hold down the Ctrl key. 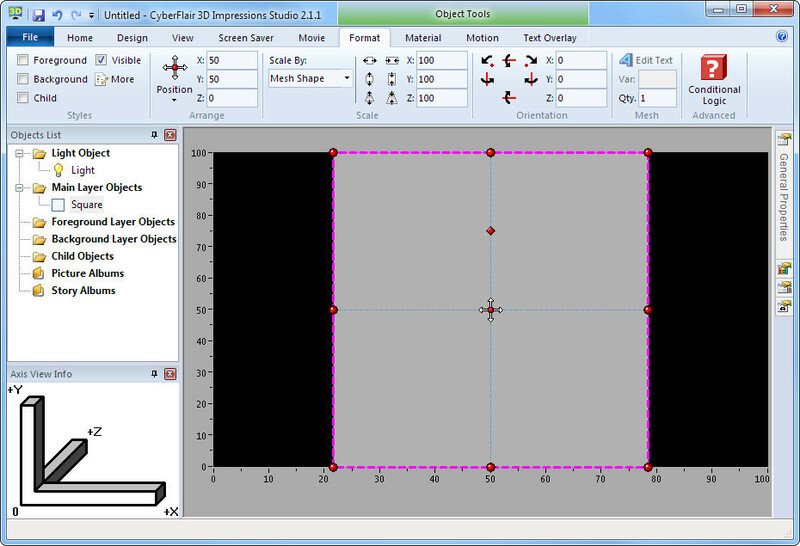 Click the 'Position' button to display a selection of preset object locations. Click a 'Quick Position' to move the object to a corner or side. 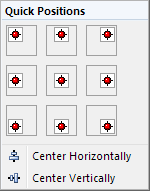 Or choose to centralize the object with its current x or y position. You can enter the position values either on the 'Format Ribbon' or the 'General Properties' window. The diagram below shows these locations once you have selected the object to be moved. Enter the desired value locations within the 'X:', 'Y:' and 'Z:' edit boxes. Select the 'General Properties' tool window and enter the desired location values within the 'Position X %', 'Position Y %' and 'Position Z %' properties. Sometimes it can be desirable to want to make an object appear in a randomly chosen position. This can be achieved by specifying a value range for any of the General Position Properties by using the '<' (less than) character, between the 2 values that determine its range. Please note that once you use a ranged position, the object will not be shown in the main, central view, but is still accessible within the 'Objects List' window. A 'Position X %' given a value of '50 < 100' will mean the object will be placed somewhere in the right hand-side of the screen. And, as each time the object leaves and re-enters the scene, these values will be used to choose another randomly chosen position.